Daughter of Ra the Sun God Defender of the World Order, Lioness headed Sekhmet was also the patroness of physicians who could either give or withold injury or disease. Sekhmet was also the patroness of Warriors and women. In this Nubian version she forms the rebus "I embrace and protect everything under heaven." The glyphs on the reverse are the ancient Egyptian blessing "May you be given Life, Health and Wealth." Wife of Ptah, god of Artisans, mother of Nefertum. 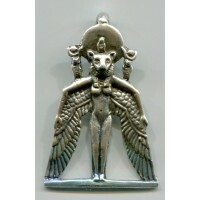 As an amulet, Sekhmet is a very protective Goddess. Hand made in Sterling Silver or Bronze by artist & author Maya Heath, this piece is 21 x 43 mm. Usually ready to ship within 2 weeks. Item Number: DS-5318 | Approximate Size (Inches): 1.00 wide x 0.05 deep x 1.50 high | Approximate Shipping Weight: 0.25 lbs.